Most of the wonderful things that are said about this park are true. We’ve stayed here three times and plan to go back, because there is so much to do. Just keep in mind that this park is within a very active military installation. There can be aircraft noise, sirens and etc. anytime day or night. The park has lots of rules and it seems they have lots of people to come out and tell you about the rules. I like good order but this place takes it a little above and beyond. Also, during all three of our stays here there has been a sewer smell that covers the whole area, usually starts soon after a ship comes in. As I said, we will be back just the same. We arrived here with reservations made 4 months ago for a front row site. At registration we were told that we didn't have reservations even though we had a confirmation number. The check-in person had a list of March 10 arrivals and our name wasn't on it. The computer was down so she couldn't double check. We were told that dry camp was all that was available. We need electricity. My wife has to have oxygen wile she sleeps. We asked to see the manager. It being Sunday the manager wasn't in but the office person called her and she agreed to come in and talk to us. We were directed to the dry camp area to wait. We waited for about an hour and half. My wife went in to deal with the manager. She got the same story. We didn't have reservations. We weren't on the list. The manager did find us a spot with electricity and water for the night. She said she would check things out the next day if the computer came back up. The next day we went to the office and the manager produced a piece of paper with my name and an arrival day of April 10. No Way! When I make a reservation I have an index card with name of the establishment, address, phone number, arrival date and departure date. My index card had March 10 as the arrival date. When making the reservation no way would I look at March 10 and say April 10. At first I thought they bumped me for someone else or was punishing me for my complaints last year. But, I've had a week to think it over and I don't think they would do something like that. At least I hope not. We couldn't stay any longer at Pelican Roost so had to scramble to find somewhere else to stay for 10 days. NAS Jacksonville was full. We don't do commercial campgrounds unless we have to. We had reservations at Eagle Hammock to arrive on March 20. We called them and they gave us an additional 3 days up front. Crooked River State Park adjacent to Kings Bay had a site available until the weekend at which time we would have to move someplace else for 2 days. We didn't want to do that. We were able to get 6 days at Laura S. Walker State Park in Waycross which turned out to be a great choice. We arrived at Eagle Hammock on March 17 and checked in with no problems at all. It was not a good experience at Pelican Roost. 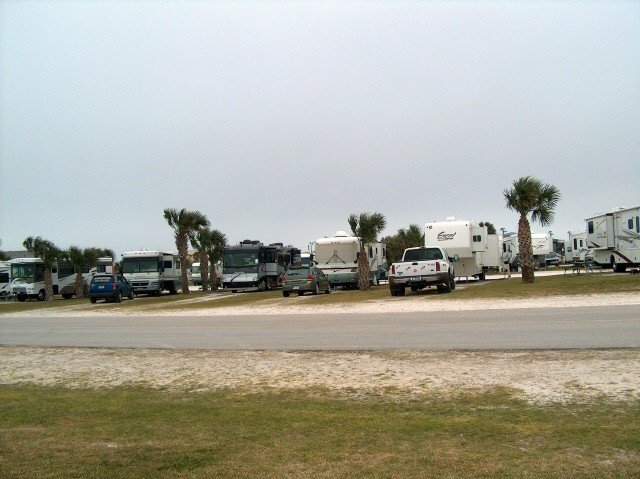 A wonderful RV park with great scenary. The hosts Ed and George are great. The new manager is not very concerned about the guests. I saw her chew a wounded Iraq veteran out because he let his service dog off his leash to exercise in back of the rv park away from all rv's and guests. This was very embarassing. He left RV park the next day. R.L. left this review using the Directory software: Be sure to enter by way of the main gate. They do not encourage you to use the commercial gate. The gas station on base looked to have diesel (green handle) (?) but price wasn't posted. Gas was much cheaper, about .14 cents, than on outside. We were put on the back row even though we'd had reservations for several weeks. Asked to extend and was told we'd have to go on the grass and if a unit came in onto the slab, they would get preference for the 50 amp. Decided to go to Kings Bay. We stayed here for a week during the Thanksgiving holiday. We made our reservation late and we were told that we had to stay in the grass, called overflow. That was fine, but we asked the office if we could move when people started to leave. They could only offer a different site at the day of departure and that was across from the old bathhouse where they were putting on a new roof where nails were flying left and right. Because we saw people come and go all the time, with sites remaining empty for multiple days, we went back to the office still they could not offer any desirable site. They have maintained for several years, at least, that they never know who will be assigned to a spot as it is done randomly by the computer in the morning of the assignment. Yet several days in advance, when asked for a empty spot-they would say that so and so is assigned to that spot. A new arrival a few days after we arrived chatted with us and indicated that he always could get a spot because he knew the management, but some of his friends could never seem to get in. The grassy site we were in was full with burrs, ants and we were tracking these including dirt inside the motorhome. We put out a lightweight cover that does not harm grass or in this case weeds, but soon enough we were handed the rules and told to read rule 12. NO carpets (also no fences). After the holiday I went into the office to take this up with the manager and also mentioned that our neighbor had 3 fences around his patio. It happened that he is a Host and may stay there for 6 months, so some of these rules do not apply to them. He should be comfortable. But still no carpet for me. It seems like that at least 10 sites (out of 49) are taken up by paid staff, host, cleaners, maintenance folks ,etc. Overall, our impression is sadly negative. It appears that the park is largely managed for the benefit of the staff and not for the qualified users. We have visited many military campgrounds across the country and Mayport has a great location, but due to poor management, in our view, we will not be back until someone gets the message and cleans house there. First time we stayed here a month during the winter and would not do it again. So many units parked in what they call overflow sites and they share utilities so it created problems with electricity as too many people used portable electric heaters to heat their trailers. At check in we asked about a monthly rate and check-in clerk gave us an earfull. 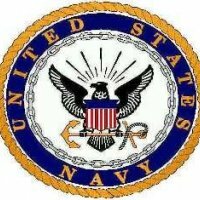 Said we should not complain about paying the daily rate as they have great views, WI-FI and full hook-up and are rated the #1 Navy campground (found out later it was by SMART). My husband was ready to leave after the tirade and I convinced him to just pay the fee and be quiet. Several of the old timers were there as volunteer workers and they said during conversation that so many of the regulars will not come there anymore, do not know what that means but since we heard it more than once there must be some truth to it. Will go here during the summer as we have done in the past when it is not overflowing with too many campers. I Agree with all the positive remarks. Mayport is a beautiful well kept campground. We were taken back, several times by two different host. Our small dog, wanted to stay out after a walk, and my husband hooked her up to a small "chain". The doors and windows were opened, so we could keep a close watch. One of the hosts was walking thru our site, and our dog began to park. We immediately went to see, what she was barking at. My husband was told in a arrogant manner, dogs were not to be left unattended. I feel unattended means leaving a dog out while you leave the campsite, or having the unit, closed up, were you can't watch the dog. Our dog is generally not a barker, but she felt the man was coming on our campsite. She loves people and the outside. We did not leave her out after that. The day we were leaving, they had brought a model of a scud missile launcher, which was directly in from of our RV. My husband was coming back from walking the dog, and wanted to get a closer look of the model. Another host, yelled at my husband, that wasn't a dog walking area. It was only about 20 feet in front of us. We have always followed the rules, especially when it comes to our dog. I just felt the men just liked to feel they were entitled to shout orders, when they had the chance. We had been to Mayport several years ago, and it was full just like our recent visit. I can't understand why they need 10 host, who just take up spaces, and act like they own the place. Very Friendly and pleasant small campground right on the water. This was our very first ever camping experience with our new Jayco. Lots of Fishing, beaches were very private and clean. There were a lot of ammenities on the base-but we didn't really use them-we just relaxed in the sunshine. It was great sitting at the picnic table eating watching all manner of huge naval ships coming in and out. A very positive experience, and the ferry ride over was well coordinated. Don't miss a day trip to Amelia Island while camping here-Fort Clinch at the northern end is worth the effort to get there and the island is beautiful.